Dangers of ESD to computers and electronics. Electrostatic discharge (ESD) is a term for common static electricity. Getting a shock from the door knob may not hurt you much, but the same kind of shock can put your computer in intensive care. This danger can occur when working on the computer or handling internal computer components. If a static charge has built up in a component such as memory cards, graphics accelerator card or hard drive or in your body, the charge can be released into the component, effectively burning it out and ruining it beyond repair. Static shock can occur without your knowledge because the charge contains a very low voltage. Even the slightest touch can pass electricity onto sensitive electronics and damage it. This is why new PC components like motherboards and video cards are packaged in sealed Anti-static bags. The ModRight Anti-Static Mats are designed to protect your computer components, by quickly drawing the static electricity away before you touch your parts. The Mats include wrist-strap and grounding cable clip that must be attached to metal surface like your PC chassis or workbench. You might be surprised at how many computer components are returned as being defective (did not work, or failed a month later) due to ESD damage. Most companies do not track this as it’s not cost effective. To evaluated a device for ESD damage cost about $10,000, which isn’t worth it for most components (ie memory modules, Gpus, and CPUs). I’ll start my review by showing you the Ground and Wrist-straps included with both Mats. I’ll share photos of the Mainboard Mat first, before unrolling the “Super Large” Xtreme Anti-Static Mod Mat. Each ModRight Mat is packaged inside a plastic bag and rolled up in tissue paper. The two straps are sealed in zip lock bags. Each of the ModRight Mats include an adjustable Wrist-strap. The grounding snaps are Steel with Black plastic shells. The Wrist strap is very comfortable. I extended and measured the cord at 8 feet long, it’s more than adequate for most work spaces. The Ground cord measures 8 feet when fully extended and has steel Alligator clip. I’ve attached the Alligator clip to the unpainted steel leg of my workbench. The only truly reliable ground is an electrical ground that has been tested as safe. (Mod Zoo is not responsible for any damages that may occur from incorrectly connecting any ModRight ground strap. ModRight Mainboard Anti-Static Mod-Mat Work and Assembly Surface is the next in line of the ever popular Mod-Mat Series. These are a system builders dream! The motherboard form factor table allows easy identification of what form factor you are working with. The actual measurements for each form factor are available based on industry standard. A second quick reference guide is available for back panel connector identification as well. The anti-static surface is safe for all components including your motherboard, VGA cards, RAM and any other electronic parts. Placing high finish side panels and parts are not an issue either as the non scratch surface will not blemish the finish whatsoever. This assembly surface includes both a grounding wire clip and an anti-static wrist strap to ensure proper precaution when conducting your next build. Both straps are connected directly to the modmat itself so you know you have a solid ground. 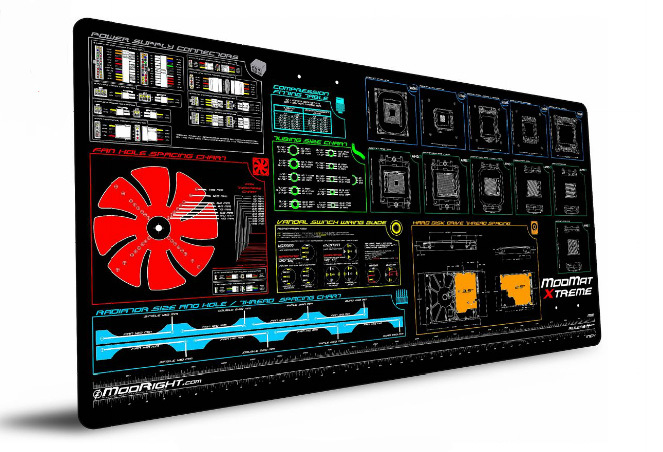 The Mainboard Mat features outlined diagrams for all Motherboards in existence. A chart of their individual measurements is printed above. Every type of motherboard input and output port is shown with descriptions. I never heard of WATX until I unrolled this mat! The Left and Right side have rulers printed in U.S. and Metric up to 430mm. These are great for making templates for fabricated parts or measuring building materials. You can also measure PC cooling fans, which have grown in sizes from 180mm to 300mm from companies like Antec, Corsair, Cooler Master, and Xigmatek. Not sure if your Motherboard is E-ATX? The diagrams make referencing quick and easy. Sizing up a JETWAY mini ITX Intel Motherboard. All of the Motherboard dimensions are listed in Millimeters and Inches. All of the Input / Output Ports have numbered descriptions. Please let us know if you have any questions and other price comparisons to share..
just an fyi: we posted this review up this morning and experienced issues with Comments not working, and had to repost it. It’s still pretty messed up. There’s a link to page 2 on the bottom of your first post, and there was a (broken) post window even when I was logged out. The actual Item being reviewed is sweet. -Makes me wish we didn’t have 60%+ humidity. Static isn’t much of a problem when you are wet. The big mat looks really really good. I think its something that can be really useful for someone who is first time builder, or has multiple builds going on at the same time. As always a great review Bill, and I think the mat is a great investment, no matter what size. I talked to ModRight and suggested they make wall poster version, for those without counter space, and they liked the idea! They’ve got the graphic design already, would be cheaper to make posters I would imagine, so why not? I will have to worry more about beer, salsa, cheese, and chips lol, then solder. I have grown accustomed to working on ESD mats at work, and one with reference materials on it would be really sweet! The first thing that caught my eye were the bright graphics, and the second was the ruler on the mat. I might buy it simply for the ruler, that is a huge bonus to always have as a reference around your work space. That being said I have a few gripes. On the Mainboard mat, I think the layout of all the mother board foot prints isn’t needed. I like having the dimensions listed, but I’d rather have that space used for other relevant material. I look at that mat and feel like I won’t use the references that take up 50% of the space. As an enthusiast, I know what size motherboard I’ll be using because I’m buying myself and if you kept the table I could cut a template if I needed one. I’d much rather have the dimensions and hole layout of the 240mm rad I’m going to cut in my case or the 24 pin molex power pin out becasue the Seasonic PSU I bought has all black cables and I don’t know which pins to jump to turn it on. I have similar feelings about the CPU sockets on the Xtreme mat. Does the average modder wonder about socket designs or not know what socket they have? Also, this information’s relevancy will drop each as every new socket gets released. I feel like this space would have been better served with more reference data. I can’t see on the chart, but conversion info like 25.4mm to 1in and a hole diameter chart would be useful too. Maybe put the mobo measurements on the Xtreme mat? I can’t tell if they’re on it. I would be really nice to be able to pick the references you wanted and have a custom chart printed up but I know that probably isn’t cost effective. Maybe a company organized public poll on the info to be displayed on the chart would be good. I wouldn’t think twice about buying the smaller mat if it had more pertinent info on it but as it sits I’m up in the air. i think this is a bandwagon i wouldn’t mind jumping on… i feel the big sized mat had a lot more tangible measurements than the one with the motherboards on it. not knocking the product, i think this thing is a great idea, and i want one. but i would like the other measurements more. + 1 To Confusis’ comment. Also, the socket charts would be better for our type of builder if the heatsink mount dimensions were all there. This review is awesome!! I’ve been contemplating getting one of these for a few weeks now. After reading this review I’ll definitely be buying one. Great Job!! The surface has been handy when handling freshly painted parts… otherwise I was using Towels.. Between this and the MNPCTECH modders ruler. No reason to fail! Just an fyi gang, I’ve got just a handful of Modright Mainboard Mod Mats left ….